Earworms can be a dream or a curse. One day it’s James Hetfield’s raspy Yeah-Heahhs running hefty loops in your brain for a while, the next it’s the strains of Boney M’s Rasputin. 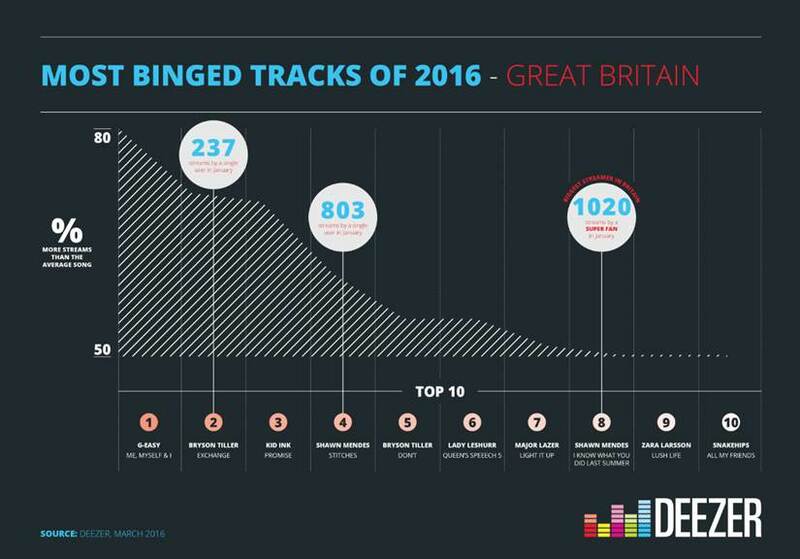 Music-streaming service Deezer has put the latest hits to the test by analysing its global streaming data to reveal the tracks that are generating the most repeat listens so far in 2016. The slow southern rhythm of G-Eazy’s Me, Myself & I is the most binged upon track of the year so far, with 76% more repeat listens per user than the average song. He is followed by Bryson Tiller whose hit Exchange appears second in the list of addictive songs with 69% more streams per user. Tiller actually appears twice in the top five, with Don’t enjoying 55% more repeat streams per user than the average song. Canadian singer songwriter Shawn Mendes gives Tiller a run for his money, with two of his tracks appearing in the top 10. Hit Stitches is the fourth most addictive song of the year with 60% more streams per user than the average song, and I Know What You Did Last Summer has also got fans hitting the repeat button with 51% more repeat streams per user. The most addictive songs differ hugely to the top 10 most streamed tracks in total, which Justin Bieber continues to dominate with three hits in the top five. Shawn Mendes is the only artist who appears in both lists with Stitches clearly enjoying success across the board. Despite not being in the overall top 10 of addictive songs, one Belieber proved so dedicated to the cause that they streamed Justin’s hit Sorry 706 times in a single month. Bieber will be making no apology for the fact that that fan will been so obsessed with the track that they were listening to it for over 41 hours in total. Deezer’s data also showed that I Hate U I Love U by Gnash proved to be the most binged upon track for under 18s with 139% more streams per user than the average song. One passionate fan streamed it 683 times in a month, equating to 45 hours of listening to just that song. Shawn Mendes also cuts deep with obsessives, with one user bingeing on Stitches 418 times in a month and another 365 times. UK rapper Lady Leshurr is one of two female artists in the top 10, with Queens Speech 5 being binged on to the tune of 55% more streams per user. She’s joined by Swedish talent show favourite Zara Larsson, whose Lush Life has continued to reward repeat listens since it’s initial release last summer. In response to the research, Deezer has launched a ‘binge button’ which will allow users to click on a button that looks at their usage and tells them their official binge track. Ranking Song Title Artist Name It is …% more repeat streams than for an average song. 5 Justin Bieber What Do You Mean?